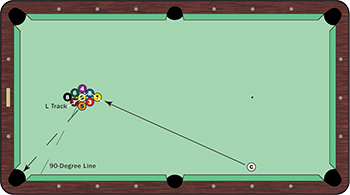 It seems as though 9-ball tournaments take turns using the 1 ball on the spot and 9 ball on the spot break rules, so you need to be prepared for both. And each requires a different approach to the break shot. One of the reasons many promoters have switched to putting the 9 on the spot is the ease with which players make the wing ball in the corner pocket when the balls are racked with the 1 on the spot, particularly when using the Magic Rack. As we know, a ball is only dead on a kiss shot if the perpendicular line between the balls is on a 90-degree angle to the pocket. When racked, the 5-7 is not on a 90-degree angle. The way players change that angle is by breaking from the side and driving the 1 into the 2. From this angle, the 1 barely moves the 3 ball. The 2 forces the 9 to move the 7 out just enough so that by the time the 5 reaches the 7, the kiss line between them is on a 90-degree angle to the corner. Racking the 9 on the spot shifts the entire rack much higher, and that L Track doesn�t even come close to creating the required 90-degree angle. Today, pros use a cut break (hitting only a portion of the 1 ball, instead of hitting it flush) and experiment with how much or little of the 1 ball they need to hit to get that wing ball reaction. Start with a three-quarter-ball hit on the 1. If that doesn�t work, try a two-thirds hit. You can go all the way to a quarter-ball hit, but then the cue ball runs below the rack, making it hard to draw the cue ball back to the middle of the table. To maintain control of the cue ball, use only 50-75 percent speed.